HHS linebacker Amontae Jernigan returns an interception during the Tigers’ spring game. 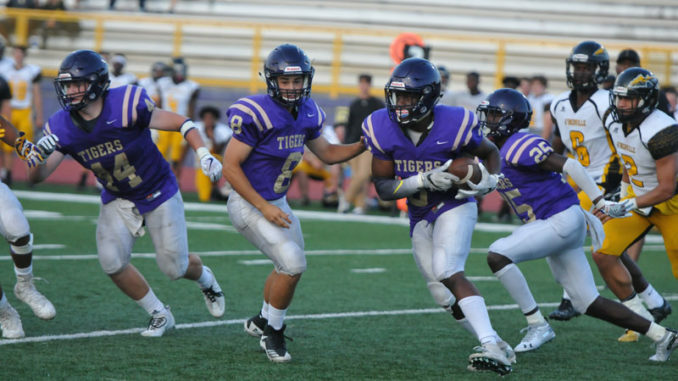 Some key points to keep an eye on for Friday (Aug. 17) night’s scrimmages at Destrehan and Hahnville. QB competition. It will be the live action look Tiger fans have had of senior quarterback Andrew Robison, who transferred to Hahnville from Vandebilt Catholic after the HHS spring game. Robison is experienced, having started for two seasons, and comes highly-touted. That said, Saltaformaggio isn’t tipping his hand as to who will be his starting quarterback come Week One of the season, the coach maintaining it’s an open competition between Robison and sophomore Andrew Naquin, who was expected to step into the role as a first-year starter through the spring. Saltaformaggio said the addition of Robison has lit a fire under Naquin, and that both quarterbacks have shown their competitive fire. Saltaformaggio said earlier this summer he planned to have a starter named before the jamboree, so the scrimmage effort of each could be the last chance for either player to make a big impression. Can the defense build on a dominant spring game effort? Against the D’Iberville Warriors, the Hahnville defense allowed no first downs in the timed quarter to cap the evening. Another strong effort against Northshore would further lend credence to Saltaformaggio’s belief that this is the best defensive football team he’s had over his four seasons at the school. The Tigers are experienced and talented and could boast one of the state’s best front sevens, led by defensive tackle Adonis Friloux and middle linebacker John Pearsall. Who will complement wide receiver Jha’Quan Jackson among pass catching options? Jackson is expected to be one of the team’s most explosive playmakers as a senior. But as he’s been “a bit banged up,” as Saltaformaggio noted, one might expect the team to dial back his workload in the scrimmage as it evaluates its other pass catchers. Noah Zeringue is a strong bet to be one of the team’s most utilized options down the field. Saltaformaggio believes Corey Lorio and Jerry Spencer will open eyes at wide receiver. One thing seems certain: a season after the Tigers were among the most run-heavy teams in the state, more balance will be in the cards this season. The scrimmage will give a glimpse into who has gained the confidence of each quarterback in live action. Encore? 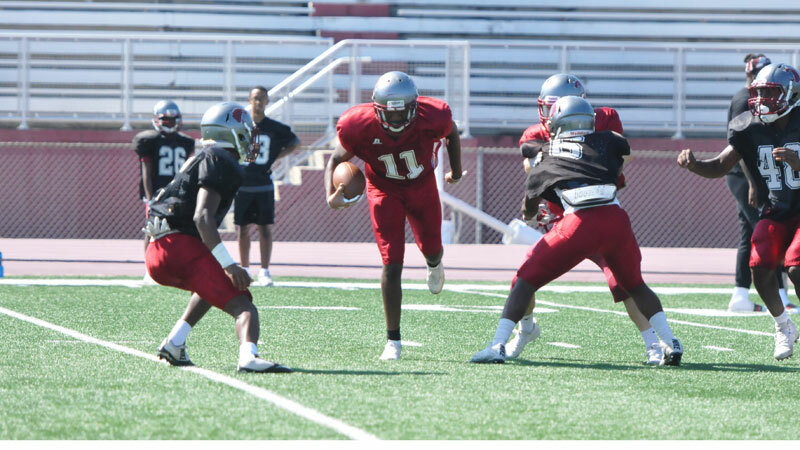 In its spring game performance against Covington, Destrehan looked every bit the experienced and talented offensive juggernaut the Wildcats have been predicted by many to be. Quarterback J.R. Blood completed 17 of 18 passes for 275 yards and five touchdowns that day, one where running back John Emery saw limited action. Emery and receivers Quinton Torbor and Quincy Brown are all SEC commitments. Blood has nearly two seasons of starts under his belt. July 4 is in the rearview mirror, but tomorrow night may yield a fireworks show at Wildcat Stadium. New look on defense. A number of new starters will hit the field on that side of the ball, but the most notable change could be how and where they lineup under new defensive coordinator Malter Scobel, who succeeds former DC Marcus Scott. 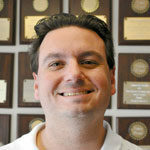 Scott was hired as John Ehret’s head coach earlier this year. Scobel was defensive coordinator of Slidell for the past four seasons. Scobel favors a four-man front over the five-man look Robicheaux has traditionally employed. While Robicheaux notes both looks will be mixed in, he acknowledged the approach would be different. Speaking of that defense … Robicheaux believes he has four players in his secondary who could sign at the Division I level, something truly rare even at a traditional power like Destrehan. For a team that projects to score plenty of points, passing into the teeth of such a talented group could keep defensive coaches up at night. Koby Hollins takes a short pass upfield during spring practice at DHS.